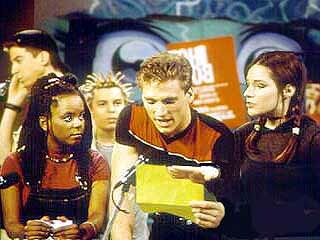 This sitcom about high schoolers operating a radio station ran seventy-eight episodes, of which Shane accounted for fourteen. It was produced for YTV by the same people who would later return to make Fries With That? Shane came on board starting in the second season, after the switcheroo that saw Andrew Walker and Ryan Wilner join the cast. Shot on a shoestring budget with minimal sets and no frills, each episode was blocked and taped in a single day, with first takes often being the only takes. There was a hanging-on-by-your-fingernails vibe to the set that Shane enjoyed, and he never missed a taping of one of his episodes, often participating in last-minute edits, rewrites and stage direction. An uninspiring series of career-day speakers leads the gang to unearth what Ms. Atoll did for a living before she became a teacher. Blaire, Morgan and George camp out in the school after hours in order to debunk a ghost story. An accidentally aired bit of singing propels Morgan into school-wide stardom. An unsightly pimple reduces Morgan’s prom-date options, forcing her to go slumming with Roger. The gang rebels when a new school-uniform policy is implemented. The discovery of an old love poem leads the gang to believe that Mr. Noseworthy and Ms. Atoll were an item back when they were teenagers. A vandal playing havoc with the school’s electrical system leads to false accusations against George. In order to clear his name, George goes spelunking through the bowels of the school in search of the real culprit — the station’s pet hamster. The boys plot to infiltrate a women-only poetry reading in order to meet girls. Blaire is in danger of losing his alpha-male status when it’s revealed he’s being bullied by a little waif of a girl. A computer program spits out implausible predictions concerning the students’ future vocations, leading them to misguided attempts to fit in with their forecast fates. Blaire tries to sabotage Morgan’s attempt to go vegan when he and Tanya make a wager about the likelihood of her success. An epic staring contest between George and Roger captures the attention of the whole school. Morgan and Sarah compete to become Upper Redwood High’s first foreign exchange student. The gang bands together to tutor Blaire when his failing grades threaten to get the radio station shut down.